The Acclaim Average wig is also available in petite and Large size. Fibre: High Quality Flexlite synthetic fibre that looks and feels real. DO NOT HEAT STYLE. Length From Side of Head: 2 1/4"
Length From Back: 2 1/2"
Best Suited to: Oval, Square & Diamond Shaped Faces. The Acclaim Large wig is also available in Average and Petite size. The Acclaim Petite wig is also available in Average and Large size. Best Suited to: Oval, Diamond & Square Shaped Faces. Length From Crown: 3 3/4"
Length From Side of Head: 2"
Length From Side of Head: 8"
Length From Front: 5 1/2"
Length From Back: 9 1/2"
Best Suited to: Oval, Round, Square, Diamond, Heart, Pear and Oblong face shapes. Affluence wig by Gabor has pretty all-over curled layers that are just right – not too short, not too long – with a light and luxurious hand-knotted top. Other luxurious qualities include; a sheer 1½” deep lace front for a natural looking hairline, velvet-lined ear tabs and Flexlite Synthetic Hair. Length From Side of Head: 4"
Length From Front: 4 1/2"
Length From Back: 3 1/2"
Best Suited to: Oval, Round, Square, Heart & Oblong Shaped Faces. Other luxury qualities include; inside hidden weft for a natural hairline, Flexilite Synthetic Hair. The Aspire Average wig is also available in Petite size. Length From Side of Head: 1 3/4"
Length From Front: 3 1/4"
Length From Back: 1 3/4"
The Aspire Petite wig is also available in Average size. Best Suited to: Oval, Square, Heart & Pear Shaped Faces. We love Au Natural Wig by Gabor because the soft barrel curls make this voluminous, sophisticated silhouette absolutely effortless. Even better, you can style the fringe forward or brush back to make the look your own. With a Lace front for natural off the face styling and resilient stretch material throughout cap base for a custom-like fit. Length From Nape: 3 1/4"
Length From Side of Head: 3 3/4"
Length From Back: 3 3/4"
Best Suited to: Oval, Round, Square, Diamond, Heart, Pear & Oblong Shaped Faces. 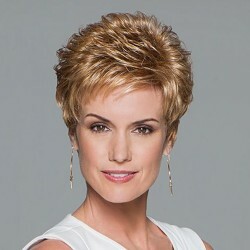 Beauty Spot Wig by Gabor is a short and sweet wig style composed of tousled waves for a fresh, “lived-in” look. The soft waves in the crown and temples allow the hair to be styled in a forward motion or swept away. Length From Side of Head: 3"
Best Suited to: Oval, Round, Square, Diamond,Heart & Oblong Shaped Faces. You'll be the Belle of everywhere with Belle Wig by Gabor! 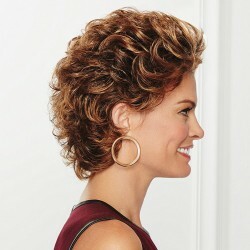 With just a shake, this softly curled, layered cut is ready-to-wear and perfect for looking your very best at any time. Length From Side of Head: 3 1/4"
Best Suited to: Oval, Round, Square, Diamond, Heart & Pear Shaped Faces. 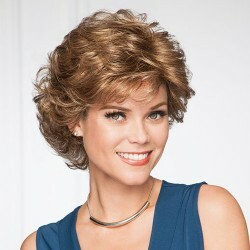 You'll feel Carefree in this adorable wig by Gabor. This chic crop is perfect for a quick change of style that is effortlessly appealing. Length From Nape: 1 1/4"
Length From Front: 2 1/4"
Best Suited to: Oval, Square, Diamond, Heart & Pear Shaped Faces.